This recipe is one that is not destined to be included in any healthy cooking cookbook, but it might win you a “best mom” award for tastiest breakfast recipe! 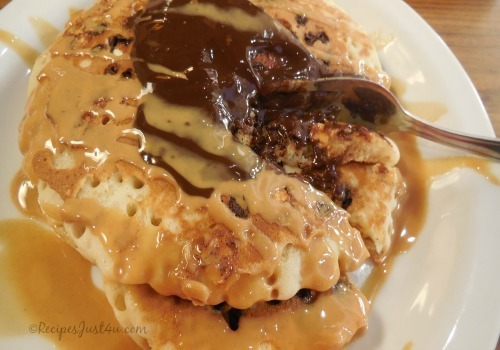 These chocolate chip pancakes are loaded with chocolate chips and white chocolate chips and then coated in a chocolate sauce as well as a peanut butter sauce. This is 30 minute meals at their tastiest! Starting off your day with perfect pancakes is a foodies dream! The pancakes are more of a dessert than a breakfast item. (after all, you don’t want the worst parent award, now do you?) But I’ll let you choose when to serve them. Cut into these beauties and say bye bye to your diet…at least for the time being. These are decadent, rich and so delicious! For the peanut butter syrup: heat the peanut butter in the microwave for 30 seconds. Add the maple syrup and gently whisk to combine. Heat in the microwave for another 30 seconds, whisk, and then set aside. For the chocolate syrup: In a saucepan over medium heat, combine the cocoa, sugar and water. Bring to a boil and let boil 1 minute. Remove from heat and stir in vanilla. Set aside. For the pancakes: In a small saucepan, combine the butter and milk. Cook over a low heat just until warm and the butter is melted. Let cool slightly. In a bowl, Combine the flour, sugar, baking powder, and salt in a large bowl and whisk well. In a separate bowl, whisk the eggs with a fork. Stir in the milk mixture, then the dry ingredients and mix just until barely blended. Fold the chocolate chips and white chocolate chips and mix until combined. Heat a large skillet over medium heat. Add about 1 tsp of the butter and melt until bubbly. Place a scoop of the batter for each pancake onto the hot surface and cook until bubbly on the top and golden brown on the bottom. Turn and cook until golden brown on the other side, about 30 seconds more. Repeat until all the batter is used up. 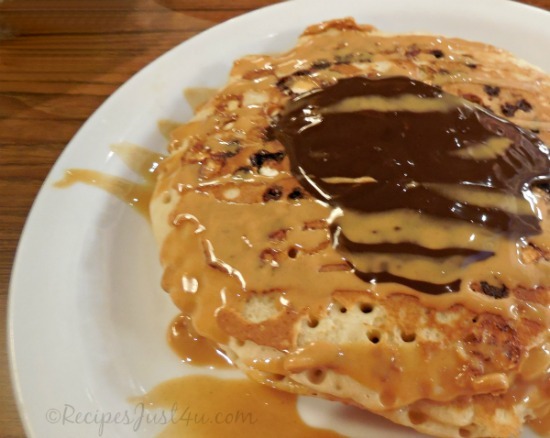 Spoon over some of the chocolate syrup and then drizzle with the peanut butter sauce. Serve warm and enjoy!